Whether you’re in a car crash, sprain your ankle hiking, or the witness to an accident, SAM splints are one of the most versatile tools in first aid. By stabilizing broken bones or sprained joints, this first aid kit item keeps bad injuries from getting worse. Broken bones and sprained joints might not be as deadly as a bullet hole, but unstable fractures can quickly become dangerous and can cause permanent nerve damage if left untreated. SAM splints make a temporary cast for injuries to ensure that the broken bones don’t move the wrong way and exacerbate the problem. SAM splints are made from a thin sheet of aluminum covered in foam. When the aluminum is flat the splint is soft and malleable, but when folded it gets rigid and solid. The foam is designed to be smooth and non-porous, so when it gets dirty it’s easy to clean and reuse. SAM splints come in several different sizes, but 36 inches is the standard size because it’s long enough for both arms and lower legs. Don’t worry about purchasing a smaller-sized splint because a larger splint can easily be cut with scissors to any size or shape. There are 3 basic bends that will make the SAM splint as strong as it needs to be. Bend the splint lengthwise down the middle in a C-shape. For a stronger splint, bend the edges back in a reverse C-curve so there are 3 folds, 1 big one in the middle and 2 smaller ones in the opposite direction on the edges. The strongest fold is a T-curvewhere you fold the splint in half lengthwise then bend half of each side of the fold back so that a cross section of the splint looks like a T.
SAM Medical splints are somewhat higher quality than splints made by generic brands, and they are only slightly more expensive on average. SAM splints are extremely versatile since they can be folded or cut to any shape or size that's needed. Each type of splint is made slightly different depending on the bone or joint being splinted. Finger and Thumb - Fingers and thumbs can get jammed or broken in the most painful ways during the course of daily life. There’s no need to buy the finger-sized SAM splint. Cut off a small piece of the full sized splint to keep your finger straight and protected while it’s healing or while you're on your way to the hospital. When making a finger splint you can either form a straight splint or a position-of-function splint. The position of function is the natural position of a body part when it's being used. For instance, when your hand is relaxed your fingers are slightly bent, not straight out or curled into a fist. Straight splints provide more protection and support than position-of-function splints because they encase the finger and cover the tip. When straightening the finger is too painful or if the bone is not set, make a position-of-function splint that is bent to the necessary shape. This provides less support, but should be more comfortable. Position-of-function splints can also be used to protect a cut or damaged fingertip. In this case, let the splint extend a little beyond the tip of your finger to prevent bumps. Wrist/Forearm or Wrist/Forearm sugar-tong splint - The sugar-tong splint will provide extra stabilization and limit elbow movement. It can be used in conjunction with a sling around the neck to keep pressure off the elbow. Figure 8 Ankle Splint - Ankle injuries are extremely common while hiking or running, especially off the beaten path. In these cases help may not be a phone call away, so getting back to civilization becomes a priority. These splints become so rigid and sturdy that they will let you put weight on a broken leg or ankle. Fold the splint in half around the bottom of the foot like a stirrup. Wrap 1 side of the splint around the front of the ankle towards the back. Wrap the other side of the splint overtop of the first so that they cross in a figure 8 pattern. Make fine adjustments to the splint so that it fits better on the patient’s leg. If there are loose pieces or gaps, you can crimp the splint with your hands to remove slack. Ankle splints can be used overtop of shoes or directly on the foot with the shoe overtop. Before you make the splint, remember that you should not be bending it around the injured limb because it will cause a lot of pain and possibly further injury. Instead mold the splint to a close approximation around the patient’s uninjured limb or someone else’s limb. Ankle splints can go on over top of or inside shoes if the patient still needs to walk. If the ankle bones are exposed, tape some gauze or cloth over them before applying the SAM splint in order to avoid rubbing or chaffing. Single SAM full leg splint and Double SAM full leg splint - When splinting the entire leg, 2 SAM splints are ideal, but 1 can be used in a pinch. 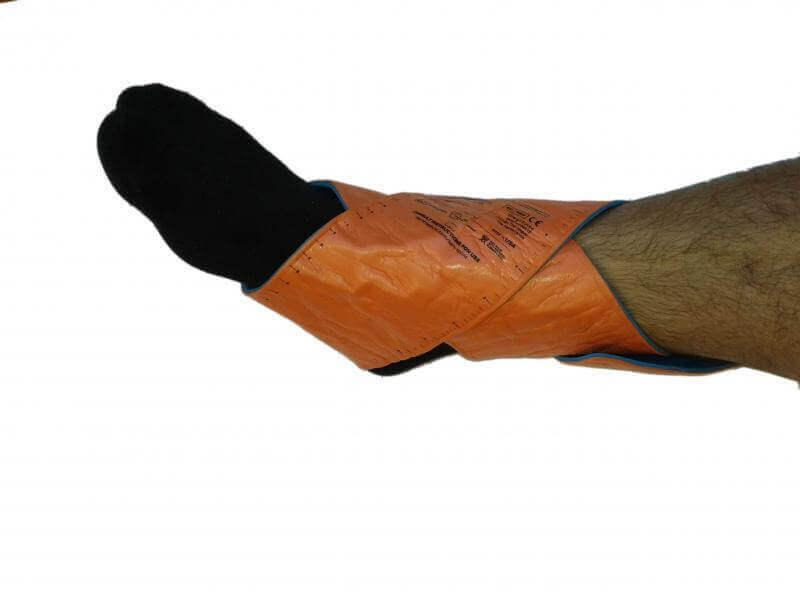 To provide extra stabilization with only 1 splint, wrap the uninjured leg to the injured leg. Knee - When splinting a joint the bones on either side need to be held in place. Since legs are so long, knee injuries need 2, 36 inch splints to hold the upper and lower leg in place. Neck - A common injury in car accidents or other high-speed collisions is damaging your cervical spine. In high impact crashes your head is like a bowling ball whipping around at the end of your neck; the extreme whiplash can break the relatively fragile bones in your neck. When you try to move your head after the accident, the broken bones can damage your spinal cord causing nerve damage and paralysis. When EMTs arrive at the scene of a car crash they use cervical spine (or c-spine) collars, backboards, and duct tape to keep the patient’s head from moving until they can be examined by a doctor. 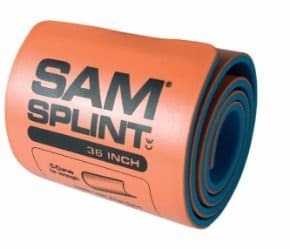 With some tape and clever oragami the SAM splint turns into a relatively comfortable c-spine collar that will fit on any sized patient. Shape it around your own limb before splinting your patient. Only make small adjustments on the patient to avoid unnecessary pain. For a leg brace you can put the shoe on right over the cast to stabilize it. When you’re finished with the splint always check circulation in the extremity by pinching the finger or toe nail until it turns white. When you let go the color should return to normal in less than 2 seconds. It is radiolucent, so it doesn’t need to be removed for X-rays. Multitools or trauma shears are great for cutting and shaping a SAM splint, and they have many other uses besides.